The following piece appeared in the Irish Examiner Newspaper about the Niall Linehan Construction refurbishment Examiner Article 2 Sydenham Terrace Monkstown Cork. No 2’s location is spot on for families, with a national school close to the entrance to Sydenham Terrace. Some things just get better and better with age — and the fine three storey Victorian home at No 2 Sydenham Terrace is one of them. Now coming up on 200 years of age, we last featured this classic in Monkstown, Cork harbour in these pages back in 2003. Then, as the private home of an interior designer it already looked the business, lush in old heritage colours, richly draped and swagged. It had a €750,000 asking price back then; almost a decade later, No 2 is back up for sale, in even better health, after money and attention’s been lavished on it, and it has all been made even more family-friendly, especially thanks to the quality of its sun-room improvements. No 2’s asking price as a true walk-in job (shoes off, mind the cream carpets, though) after all the extra spend is €620,000, via estate agent Cearbhall Behan of Frank V Murphy & Co. The adjoining end-of terrace No 1 Sydenham went up for sale in August of last year, and sold within weeks of hitting the market, also featuring in these pages, and the price register shows it selling for its asking price of €495,000: there’s been a full complement of builders in there recently, doing upgrades for its new owners. Whoever buys No 2 would be hard-pressed to find much, or anything, to tackle or spend much more on. These terraced homes, eight in all, were (like much of Cork harbour’s finer Victorian homes) built for British navy officers. While they look relatively modest from their rear lane main access (see picture on page 10) with two-storey facades, their face to the public, to Monkstown’s harbour fringes, and to the sea, is a far more impressive and impassive three-story presence, or more correctly, two storeys over lower-ground rooms. Thanks to very clever, subtle touches and a sensitively added conservatory, No.2’s best space for family life is this lower ground level, home to a kitchen and adjoining family room, making for a 30’ wide and 15’ deep great space, with immaculate oak parquet flooring, and this same floor (sourced from Wilsons’ architectural salvage yards in Northern Ireland) continues into an elegant 25’ by 10’ conservatory/sun room, Victorian in style, but not slavishly so. While the house’s very best views are from the upper rooms (with five windows across the width), this sunny spot is where you’d want to spend daylight hours, and that’s why one end is bulwarked by a deep day-bed, a true lounging spot, and ideal for cuddling up on with the kids (fabric-meister Ken Jackson did most of this house’s soft furnishings, sofa coverings, window seats, bolster cushions and curtains). Handily, for tidiness sake, there’s huge storage capacity in deep drawers right underneath. The building work here was done by Niall Linehan of Linehan Design, and the conservatory is built in hardwood, triple glazed and has twin, pitched roof lights set into the ceiling. Exposed reclaimed brick’s a bit of a feature here in a back wall, set off by a creamy mortar, and there’s more than enough room here for a casual dining space, table and seating. French doors open this room out to a re-done large terrace in limestone, and the garden runs down over 100’ towards the views, stepped down on a few tiers, and with a mature tree area home to a playhouse and a henhouse, recently evacuated by a wily fox who quite approves of the modern trend for hen-keeping, even if he doesn’t quite get the more holistic ethos. Back from the sun room, the kitchen’s an absolute stunner of hand-made simplicity, with hand-painted units now lightening the look (there used to be stone walls under countertops in the previous ownership), with double Belfast sinks, a Rangemaster stove, island with white marble tops, a feature plate rack and larger presses, recessed lighting, plus a feature pendant light for mellow mood-setting. 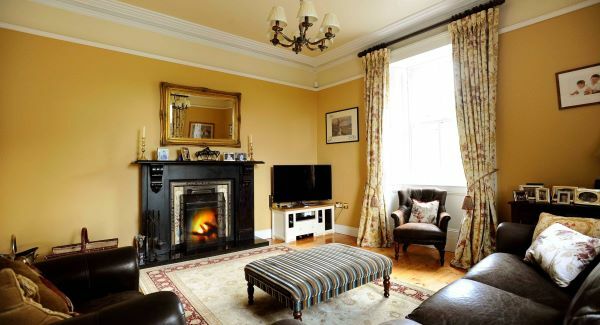 Across this room, by the sprawling sofa, is a specially-sourced, super-plain old white marble fireplace, with limestone insert, and a cast iron open stove/enclosed basket. Either side of the chimney breast are storage presses, done to the same exacting joinery standards as the kitchen units. Behind the kitchen, under the house’s centre, is a utility/laundry room, with access to an elevated storage space to the back of this lower ground level, while the stair return going back up to the main, entry level has a small play/storage area with skylight. Formal rooms are all on the entry/midships level, off a graceful tall hall, with Corinthian columns flanking an entrance to a study/den, with walls lined in bookcases and shelving: though separate, it’s almost an ante-chamber to larger rooms, and has window seats looking out to the stone-flagged landscaped entrance courtyard, gate and parking. The Regency feel kicks off right away in the main reception hall, with those columns, stained-glass window on the staircase, and a mirrored glass display cabinet hints at the tucked-away grandeur of the 18’ by 15’ drawing room, with harbour in view beyond. This restful space, with white Georgian fireplace and mellow Farrow and Ball hues on the walls, has three arched sash windows looking south-east over Monkstown, to the church steeple, shipping and naval activity, as well as to the skeletal cranes at the former Verolme. If you like your views nautical, you’re already berthed here. These terraced houses are quite wide, so despite the width of the drawing room, there’s still scope for the formal dining room to have two similar, arched sash windows, and lofty twin old pine doors on hefty hinges link this to a second living room: both of these airy rooms have age-appropriate fireplaces, unfussed ceiling cornice work and roses (they’re Victorian, after all, not Georgian,) and carpets are a neutral, fawn shade, similar to the upstairs bedrooms’ level. A central carpet runner wends its way up the stairs and it twists and turns to the first floor proper, where all four bedrooms are ranged off the landing, and three of the four have the most elevated waterways views of all. And, three of the four bedrooms have cast iron fireplaces, making for seven chimney-pieces in all. Even if the bedroom trio are unlikely to be lit very often, or at all, they’re still focal points for candles, dried flowers or other features. There’s no en suites, so bedrooms keep their original proportions and freshness, and the main family bathroom (like the second shower room and guest WC) has encaustic tiles sourced from Fired Earth in Dublin, colours are in shades of grey, the bath’s a free-standing cast iron one, double ended with central tap, and there’s a separate shower enclosure. No 2 has all mains services, an alarm, double-glazed sash windows and a huge comfort factor, and given the number of open fireplaces, the BER rating’s a pretty decent D1 for a home of this vintage. The relocating owners have clearly enjoyed their time and effort here, the family’s grown in number during their tenure, and they reckon they’ve the energy still to take on another house and family home project. No 2’s location is spot-on for families, with a national school close to the entrance to Sydenham Terrace, and community-minded Monkstown has a tennis club, sailing club for dinghies, a new marina for larger craft, and a well-regarded golf course up above in the wooded demesne. A recent arrival is an Italian cafe, while a second bar by the busy Bosun restaurant is currently preparing to reopen in the coming weeks. One of No 2’s owners is in the navy, and so had work at Haulbowline in his sights while here, and Cork harbour’s many sizeable employers are within a short drive, while Cork city’s an easy commute if hitting Rochestown mid-way at handy times. The problem is, No 2’s so relaxing, you won’t want to leave… so it’s just as well there’s a home office. VERDICT: With 3,200 sq ft of sheer quality and comfort, in a grandstand Monkstown setting, No 2 Sydenham Terrace works on every one of its three levels. Irish Examiner newspaper article about the family home featured in the property section about 2 Sydenham Terrace, Monkstown, Cork City. Niall Linehan Builders Cork carried out the refurbishments and conservatory and terrace extension to the house, a Victorian period residence at Sydenham Terrace, Monkstown, Cork for naval officer serving in Haulbowline Navy base. East Cork’s period Ballyonane House has a singular calling card that’s going to reassure prospective buyers — the work’s all done, to a very high standard, and it’s going to remain comfortable and manageable to run for decades to come. Dating to the late 1880s, and extended and renovated in tranches in the 1990s and through the 2000s, the five-bed 3,000-plus sq ft country home near Cloyne is a truly turn-key job. That makes it a rare market offering in the vicinity, in the midst of prime farmland, close to Ballymaloe, beaches, and a half-hour commute from Cork city. 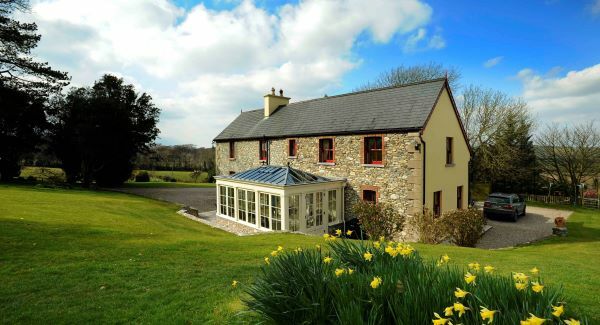 Done from top to toe by its current owners, who seamlessly added a further wing after they bought it in 2000, and who more recently added on a top-drawer orangery or conservatory which rounds out its creature comforts, it’s for sale with joint agents Catherine McAuliffe of Savills and Dominic Daly, who give it a price tag of €695,000. That’s for the main house, on four acres with an American barn-style stable block with six loose boxes, a secure garage, hay barn, classic fenced paddocks, sand arena — all at the end of a long, daffodil-dotted approach avenue, the sine qua non of a true country pad. There’s a further 12 acres of good farmland above the house, with sea views, with a €150,000 price tag for those who want more land with their country home. It would be almost an insult to Ballyonane House to call it ‘country home-lite’ — because it has all the necessary quality craftsmanship and finishes. Rather it’s ‘lite’ because it’s all so manageable — no need for staff, for maintenance worries, repair bill headaches and so on, and the list does go on for larger, more sprawling period piles on estate acreage. Stone-built in locally quarried limestone from Carrigacrump, and sympathetically extended in the last decade in a stone of matching quality with brick quoin features around windows, this two-storey family home is L-shaped, and now over 3,000 sq ft, all of it usable space. Its latest addition is a 19’ by 13’ conservatory/orangery, the owners’ favourite space and added on after extensive research and quality checks of companies around Ireland and further afield. In the heel of the hunt, it was done by Vale Garden Houses, based in the UK and supplier to Britain’s National Trust properties, with double glazing painted mahogany around aluminium frames, all topped off with a special metal box gutter, with exacting parapet lead detailing and flashing. It is complete with temperature-controlled opening roof vents for hot days (23/24 degrees and the vents open), and it has underfloor heating for all other times. You could lie on the floor at night and star-gaze through the roof, without risking chills. Local workmen did the base and floor in preparation for the specialist erecting crew’s arrival, and they flew over for a fortnight of meticulous, painstaking work, with a lead welder (solderer?) coming for the final touches. In terms of period authenticity, finish and design detail, it leaves most other conservatories in the shade, and makes the final grand stamp on Ballyonane. Then again, in case other quality conservatory Irish companies are feeling slighted, or local home-owners want to follow suit, at least take comfort from the fact it wasn’t cheap — think in the region of £65,000, so you do very much get what you pay for. In this case, it’s Ballyonane’s best-used room. The family who’ve relished and clearly enjoyed the challenges here are able, fit and young enough for another life project, and have bought something on a bigger scale to engage their family’s enthusiasms, able to accommodate horses, boats and more. What they’ll take from Ballyonane House is the assurance they can build and restore and add comfort to an old house, without sacrificing old-house charm and essence and sense of place. Fortunately, too they’ve also amassed a number of contacts in the trades and professions to carry onto to their next house-in-hand. In fact, since doing the orangery here with that UK company Vale, they acknowledge the could have gone with the likes of Niall Linehan Construction, part of the Linehan Design family business in Cork city a second (third?) generation who are at the top of their game in building, kitchen and furniture design and manufacture and who did significant joinery and built-ins work here. 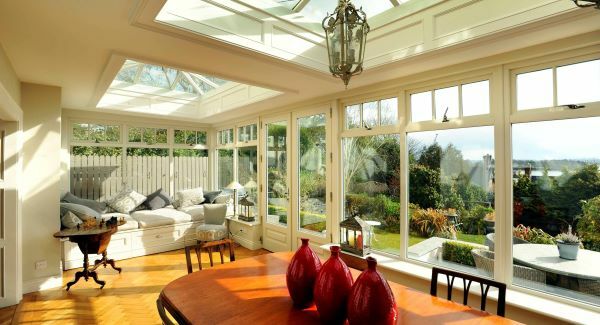 Niall’s recently completed some high-end orangery extensions seen by the Irish Examiner around Co Cork, showing that even if house trading mobility is at a low-ebb yet, families are spending on making themselves comfortable while they sit out a recession. Enough, for now, about a conservatory and yes, there is indeed a house attached to this Cloyne sun-spot, and it’s a strong, robust stone home now more than doubled in size from its original farmhouse status; its owners note that there is a mirror-image of the original nearby in East Cork, so it may have been built to a proven pattern (or just done by an enterprising builder who made off with the plans!). Just off the sun-room, through double doors and with a matching Creme Marfil marble floor is a family dining room with long pine table, and beyond is a new, bespoke handmade kitchen, crafted in solid pitch pine by a company over the county border, by Ardmore, called Waterford Wood. It accommodates everything, swallowing supplies in capacious larder presses, and camouflaging all integrated appliances, with just the Rangemaster cooker left to rightly dominate proceedings. 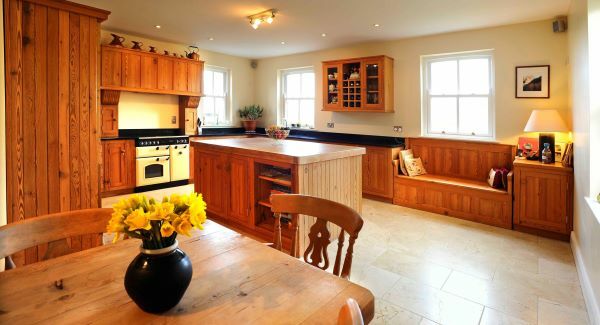 The island is topped with 4” butcher’s block type finish in pitch pine (so, easy with the cleavers,) the run of units elsewhere is topped in black granite and there’s a gable end window seat for views east towards Ballycotton and the sea — where only an estate agent fired with enthusiasm might really claim a sea view. But, the sea is close to hand, with coves and beaches at places like Ballybrannigan and Churchtown, with Garryvoe beyond, and the family here take horses to the shoreline for canters, riders to the sea, in about an hour’s exhilarating round trip. On return, the heated horses might get hosed down outside at the stables, but the occupants of Ballyonane have the more human rewards of the Helo steam room/shower system in the accessible utility/cloakroom which is also home to the oil heating boilers for added heat for drying-off. The utility room alongside, meanwhile also has pitch pine units, topped with Hanstone quartz, with a Belfast sink inserted for washing mucky gear, while enjoying rural plain and low valley views back towards Ballymaloe and Barnabrow from a feature corner window. It’s possibly down to the lure of that super-comfortable sun-room that much family life tends to gravitate to this end of the doubled-up house, but when you finally get to the original wing, that doesn’t disappoint either, with lots of original retained features, good fireplaces, working shutters snuggling up to recently made hardwood double-glazed sash windows, and with typical high ceilings. Ballyonane has two formal reception rooms to the front of the house, either side of the hall with its feature stained glass door and tiled floor, with French Winkleman hand-cut tiles. The 14’ by 14’ living room has a dual aspect, south and west, pitch pine floor and slate and cast iron fireplace with tiled inserts, with working window shutters and heavy, lush drapes. Walls throughout all of the house, including internal walls, have been dry-lined, helping Ballyonane achieve a good C1 BER rating. Across the hall, the dining room is also double aspect, with feature period fireplace, full-length curtains bunching on the wool carpet floor as an example of going the extra mile, yard and inch with fabrics. The stairs is still original and untouched, save for central carpet runner held in place with solid brass stair rods, and up above, the house splits into two sections, one with two en suite bedrooms in the newer wing, and the older half is home to the en suite master bedroom and the two children’s rooms, one pretty in pink and bright as a breeze, the other a boy’s room with careful working Lego creations proudly on display. Comfort levels up here are as high as below stairs, with original fireplaces retained but clearly not in use: after all, the master bedroom’s Ulster carpet runs right into the grate, unsullied by soot, or even a speck of dust. In the corner of this double aspect room is a great built-in corner wardrobe by Linehan Designs, with curves in all the right places, a modern insert that looks right at home in a 130-year old house. Clearly, the work done on Ballyonane was done for the long term, with unstinting quality materials that aren’t going to date or go out of fashion (the roofs are all slate) and even the garage and stables are done to a standard well above the average, notes Savills agent Catherine McAuliffe and Dominic Daly, the latter hoping his horsey connections will help match the house here, a mile from Cloyne, with new, horse-centred owners who want a trot-in job.